Offer leadership training in reconciliation with the goal of empowering Ulster Project teens to oppose discrimination of any kind. The Mission of the Ulster Project is based on a simple idea of sharing experiences. Northern Irish Catholic and Protestant teenagers are hosted by American families of the same religion and with a teenager of the same age and gender. These Christian based potential leaders from Northern Ireland and the United States build immediate friendships to provide a safe and trusting atmosphere. The teens meet almost daily in different churches to discuss the troubles facing the teens in their homes, schools and churches and to teach new ways around the prejudices and stereotypes that contribute to the violence often found in Northern Ireland. These meetings are performed by counselors, teachers and facilitators that organize the activities to ensure participation from all teens. In Northern Ireland, an evaluation of the Ulster Project from all the participating towns and cities reveal success far surpassing the original expectations. The positive changes include parents of the project youth crossing sectarian lines in safety to work cooperatively on behalf of the Project. The youth themselves have maintained their friendships with the support of the churches and neighborhood communities. Their influence extends to a large peer group, as well as their extended families. Over 5,000 youth from Northern Ireland have participated overall through the end of the 2003 Project, and, to our knowledge, NONE HAS EVER BECOME PARAMILITARY on either side. Moreover, the project participants from Northern Ireland has been increasing by about 400 per year through the most recent project in 2012, with no project teens having participated in any form of sectarian violence. From the Arlington area, there have been visits by American participants to our paired community of Belfast, confirming the continuing cross community association there, which the Belfast clergy, civic leaders and citizens have found so helpful in reducing violence. In the United States, the American teens and adult experience the joy of “hands-on” Peacemaking, and lasting friendships that are made with the Northern Irish visitors and with other Americans. The Project has strengthened the ecumenical ties of cooperation among the churches of Arlington. Most American host families have remained involved in the Project and continue to support the project. Although not mandatory, many American teens visit their Northern Irish family the following summer. It is amazing to delight in the growth and development of our future leaders during the Project. How will your family benefit from participating in the Ulster Project? Past participants of the project talk a lot about the wonderful benefits of participating as a host family. Your family will develop friendships with your guest teen and their family in Northern Ireland. Your family and teen will also develop friendships with the other teens (both American and Northern Irish) in the project. You will gain information about Northern Ireland, experience the "Belfast accent" and participate in many fun activities. Many past teens travel to Belfast, Northern Ireland during subsequent summers which follow their Hosting year. Your teen will also participate in "Discovery" sessions which contributes to personal growth in all teen participants. Many past teens describe the project as "the best summer of my life". Your teen will also participate in service projects. After completing the project, your teen will receive a letter certifying the appropriate number of service hours which can be used for applying to the National Honor Society as well as college admissions and scholarships. The Ulster Project - Arlington is an authorized (501)(c)(3) non-profit, non-political, ecumenical organization that is self supporting. Our fun-raisers, with the assistance of external organizations and private donations, provide our operational funds. 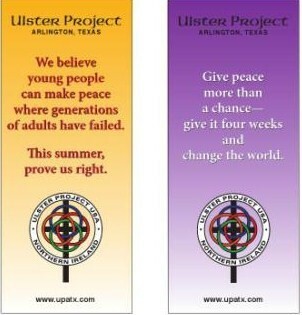 ALL profits go directly to the July Ulster Project Arlington events.